Acquisition Software | NIRSOptix by TechEn, Inc. 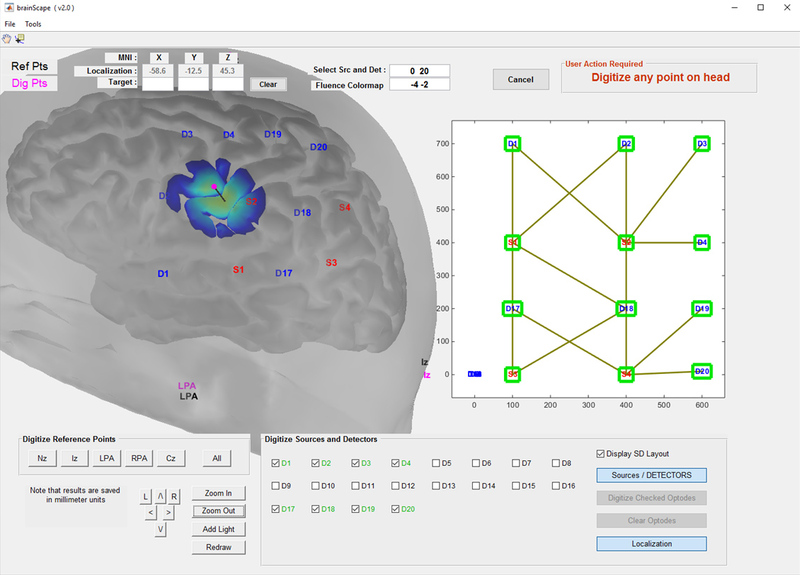 The BrainScape software suite offers real-time localization and co-registration of optical signals with the underlying cortical MNI coordinates, a longstanding goal in the acquisition and use of fNIRS data. The recently introduced software was developed in collaboration with Dr. David Boas at the Massachusetts General Hospital in Boston. BrainScape uses the Polhemus Patriot 3-D digitizer to project actual source-detector locations and pathways onto an MR brain image, enabling users to visualize the impact of their probe layout during setup. This visualization of potential fNIRS activation and optode positions adds specificity to optode locations and brain activation. A key benefit of BrainScape is its real-time projection. BrainScape provides true real-time guidance of optode locations using a stylus pointer during set-up. The onscreen display shows the exact locations on a brain image and indicates the MNI coordinates of the underlying cortical area. With the stylus, users can quickly capture the optode’s coordinates while they are on the subject’s head. After capture, the software can display the sensitivity of a particular probe setup relative to its position on the head. TechEn has also incorporated into the BrainScape software suite faster set-up with improved accuracy and consistency as well as other helpful features. With the many benefits it provides, BrainScape is an indispensable tool for increased accuracy in the interpretation of fNIRS data and improved reliability in comparing data between subjects and studies. Continuous Measurement and Display of Concentration. The CW6 acquisition software now also displays hemoglobin concentrations in real time. This and the software’s other real-time display options – including by channel and wavelength, and by change in optical density – enable fast set-up and improved feedback with respect to the acquired data signals.